References are numbered, and Links are at the bottom of the page. 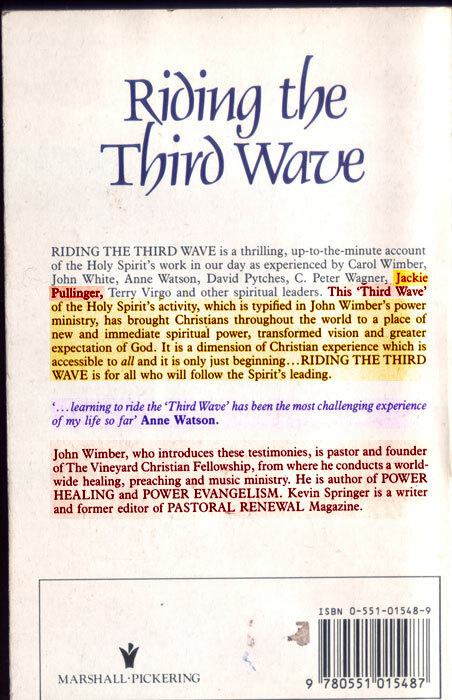 In a 1987 publication by John Wimber, “Riding the Third Wave” ISBN: 0 551 01548 9 (Published by Marshall Morgan and Scott Publications in UK and Zondervan in the US) author Kevin Springer compiled a selection of chapters contributed by various leading members of the “Third Wave Movement.” Of which John Wimber of the Vineyard Movement is credited with being one of the leading lights. Besides John Wimber, there are contributions by C. Peter Wagner (Global Harvest Ministries), Jack Deere, Terry Virgo (New Frontiers), David Pytches (New Wine), Murrey Robertson (President of the Baptist Churches of New Zealand), Tom Stipe (Senior Pastor of Crossroads Church of Denver ) and Jackie Pullinger (St Stephen’s Society) amongst others. She speaks of her receiving “about thirty hours of prayer,” during which time she learned, “much about praying for the sick and inner healing,” as she was prayed for herself. It is as a result of this contact that she credits much of the change that occurred in her ministry when she returned to Hong Kong. Here doctrine has no place for Pullinger, as she is more interested in experiencing the power of the Holy Spirit, in  (Matthew 13:24-43) this says in which the good seed sown by God grows alongside the tares (weeds) sown by his enemy (Satan). Both grow together until the harvest when they are separated with the wheat being gathered into barns, and the weeds are thrown into the fire to be burnt. It is interesting that there is a form of weed, which grows in Israel, and looks almost identical to wheat, but contains no nourishment and so is useless for food. Jesus also warned that “false prophets and false Messiahs will appear and perform great signs and miracles to deceive even the elect — if that were possible.” (Matthew 24:24 — see also Matthew 7:15-23). There is more to David Watson and David Macinnes than Jackie Pullinger cares to discuss. David Watson, a British charismatic leader, died from cancer in 1984, A corollary of this is that for Christians, death is a defeat. This, in fact, is what Wimber claimed about the death of David Watson, the British charismatic leader, despite (Wimber’s) repeated prayers for healing. Wimber ultimately died from a haemorrhage as a result of a long battle with cancer. He too was medically treated – no “power” healing for him, only chemotherapy. Watson was a leading figure in Britain’s Charismatic Renewal movement. 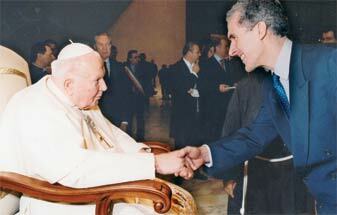 He was also an advocate of Christian unity, leading numerous ecumenical missions throughout the world. Among Watson’s many books are Discipleship, an autobiography entitled You Are My Lord, and an account of his struggle against cancer entitled Fear No Evil.” Obituary Notice, The Times, February 21, 1984. The Communion of Evangelical Episcopal Churches reports:  Anglican minister David Watson once remarked that, “This break with Rome (the Reformation), although probably inevitable due to the corruption of the time. Unfortunately, this led to split after split within the Body of Christ, with the result that the mission of the Church is today seriously handicapped by the bewildering plethora of endless denominations … a torn and divided Christianity is, nevertheless, a scandal for which all Christians need deeply to repent” (David Watson, I Believe in the Church). This call to be one undergirds the desire of many in CM to see the streams of the Church come together. David Watson and the Toronto Blessing. [Patrick Dixon’s updated reflections on TTB are presented in Section II of this book]. David MacInnes had involvement in the charismatic renewal  this eventually led to HTB running the Alpha Course “Charismatic evangelicals look to the late David Watson, for many years vicar of St Michael-le-Belfry, York, as a founding figure. Watson and David MacInnes (recently retired Rector of St Aldate’s Oxford) were mentored by their training incumbent, John Collins, who later laid the foundations for transforming Holy Trinity Brompton. Currently, Charismatics look to Graham Dow, Bishop of Carlisle, Graham Cray, Bishop of Maidstone, Sandy Millar and Nicky Gumbel, vicar and curate at Holy Trinity Brompton. A key lay person is Ken Costa, churchwarden and Holy Trinity, Brompton. Focal theologians include (Please Refer to my Hope 08 article on J. John, ) Mark Stibbe, vicar of St Andrew’s Chorleywood and Christopher Cocksworth, principal of Ridley Hall, Cambridge. The Religion-Cults website also states  “This goes back to 1967 when a handful of students and University theology professors from the DuQuesne University in Pittsburgh, Pennsylvania, got together for a retreat weekend. From there it spread to the university campuses of South Bend, Ind. and East Lansing, Mich. in 1968. The Catholic Charismatic Renewal centres on the renewal of individual commitment to the person of Jesus Christ in His Church, through the power of the Holy Spirit, as in the day of Pentecost of Acts 2. The individuals in the Charismatic Renewal believe that they have been “filled” or “baptised” with the Holy Spirit, often through the laying on of the hands. The signs of the “baptism” or “filling” may include joy, the gifts of speaking in tongues or glossolalia, resting in the Spirit or slaying in the Spirit, prophecy, healing, interpretation of tongues, discernment of spirits… the nine spiritual gifts of 1Cor.12:8-10. Religion-cults states: in ecumenism people have “More love and understanding of the Bible. Every Charismatic, both laymen and religious, all of a sudden read more often the Holy Scriptures with a deeper sense of life in the Word of God. Religion-cults also states: Music: The Charismatic Renewal has produced good soft and joyful music. So what has exactly Jackie Pullinger achieved? Page 238 (Riding The Third Wave) “Our drive for ‘purity’ meant people who fell back into sin were excluded from our fellowship. But this created a disastrous situation for the ministry: in the end, I had nowhere to bring new converts. Page 239 (Riding The Third Wave) The charismatic ministry interlude had been exciting, fruitful, and promising. But now it seemed we had done it, knew it all, and it had become damp and soggy. We had settled for another dispensation. Jackie Pullinger introduced to John Wimber. (page 240) (Riding The Third Wave) because, after all, we prayed for the sick too and a few, occasionally, got well. But the more she told me, the more I sensed a stirring in my spirit. John Wimber taught on healing. He had models and demonstrations. Now it seemed to me that if everyone we prayed with received the gift of tongues because we took the time to explain and teach them in a relaxed manner, then we could learn from others who were experienced in other areas of ministry like healing. (Citation John Wimber meets Jackie Pullinger and asks,) “How’s the work, Jackie?” asked John that first evening in the United States. ‘What Work?’ I muttered, and my eyes filled with tears as I wondered if there would be anyone at all left in our fellowship to return to ten days later. ( Citation, please see my page on the Vineyard movement) That night several Vineyard Leaders came together, and I was invited to join them. Toward the end of the evening, we prayed for each other. One by one as they ministered to they began to cry, some of them deeply with racking sobs. I’m not going to do that, I thought. Even though until then my experience of the spirit had been incredibly powerful, at the same time it was without the show of emotions. But I did cry, and my back felt warm as Bob Fulton laid his hand on it. I had an injured shoulder that was screaming with pain. “But I looked at myself (suffering from cancer), and I’m out of energy. In my spirit I was just murmuring “Oh God, oh God.” And at that point (mid January) the Lord gave me a word. I heard myself say: Shall I have this pleasure in my old age? The very words that Sarah laughingly said to herself when she overheard the LORD say she was going to have a son from her 90-year-old womb by her 100-year-old husband. (Gen. 18:10). This was a word of life from the Lord, and it touched me deeply. 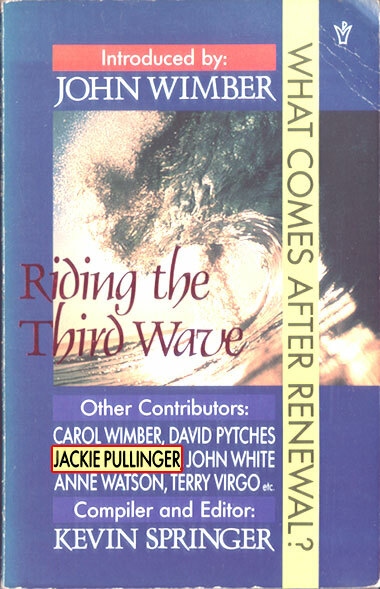 Jackie Pullinger explains her encounter with “The Spirit” On page 241 (Riding The Third Wave) The spirit keeps coming on you and lifting off then lifting off then coming again’, Bob Said I was unused to his terminology, but it felt a warmth come in waves. 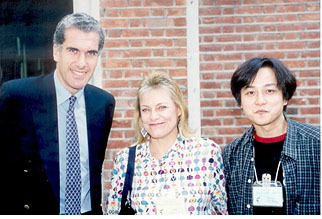 John suggested I received further prayer that week for my shoulder and so I went to every meeting I could. I must have received about thirty hours of prayer, learning much about praying for the sick and inner healing as I was prayed for myself. In his article “Divination Finds Further Expression in the Evangelical Church” Orrel Steinkamp observes: “In tracing a genealogy of Christian inner healing and imaginative prayer, it is the atheist psychologist Sigmund Freud whose teaching is foundational. It was Freud who taught that there is in everyone a deep unconscious mind and that the answer to emotional health is to uncover this hidden unconscious mind, endeavouring to reveal it and heal it. According to Freudian doctrine, everyone represses the traumas of childhood. In this repression, we forget events because they are just too horrible to contemplate. We cannot remember these forgotten events by the normal process of conscious memory. If, however, we can regress the person by certain psychological techniques, we can find the cause of many of our current problems that secretly have stemmed from these buried memories. It was this Freudian teaching that gave rise to the current practice of psychotherapy and hypnotherapy. John Goodwin writes concerning inner healing. In a CIB Bulletin Dave Hunt deals with the blending of psychology and Christianity. He relates, “Christ did not say, if you continue in my word…you shall know part of the truth, and you shall be made partially free. There is more truth yet to be revealed through godless humanists that will liberate future generations more completely than I can now free you through my Word and my Spirit alone.’ Yet that is the teaching of ‘Christian psychology.’ InCan You Trust Psychology (p.97) Gary Collins writes: ‘The Bible speaks to human needs … But God in his goodness also has allowed us [Freud, Jung, et al] to discover psychological truths about human behavior and counseling that are never mentioned in Scripture but are consistent with the written Word of God and helpful to people facing the problems of modem living’.” 69 This is another example of the subtle redefinition whereby biblical no longer means derived from God’s Word, but derived elsewhere, then declared to be“consistent” with Scripture. Regarding his psychology of inner healing, Wimber says “As these kinds of painful memories arise, I encourage the person to understand that Jesus was with them through it all, that now they may extend forgiveness. In other words, I reinterpret their experience in the light of God’s purpose.” 70 It is most difficult to understand “that Jesus was with them through it all” if the person is “being healed” of something which happened before they became a Christian. This moves us into the New Age “gospel of Schuller which states that “The Christ spirit dwells in every human being whether the person knows it or not.” 7l There is no biblical reference for this concept which is Jungian. Both Agnes Sanford and Moron Kelsey have drawn heavily from Jung, and John Wimber, in turn, draws from all three of these sources. Wimber’s executive senior pastor at Vineyard Anaheim at the time was Sam Thompson, a psychologist with heavy input for John Wimber on a daily basis. A report concerning Jackie’s involvement with the Toronto Blessing. “It is incredible that some formerly pretty ’sound’ and well-respected people of God are now appearing alongside John Paul Jackson at the Detling Summer Conference (started today)! http://www.detling.com/events/detling/speakers.php Other speakers there include Eric Delve and Wayne Malcolm. RT Kendal has been seduced by the Kansas City Prophets (to which the slick John Paul Jackson is aligned) and the Toronto Blessing experience (linked to the false KC prophets) since about 1990 so no major shocks there (though sad he has not seen through them yet). And it is no real surprise to me either that Jackie Pullinger-To, because of her links with YWAM et al., has embraced questionable prophets and questionable practices over the years. What a tragic shame. Tragic. As well as tragic for the flock seduced by this crowd this week. AD 2000 states:  Jackie Pullinger speaks at an ecumenical conference, “GCOWE ’95 Jackie Pullinger, one of the most compelling speakers on behalf of the world’s poor urban dwellers, issued an emotional appeal to the audience to cry out on behalf of the silent and the down- trodden of the world’s cities, which by the year 2000 will contain approximately half the world’s population. 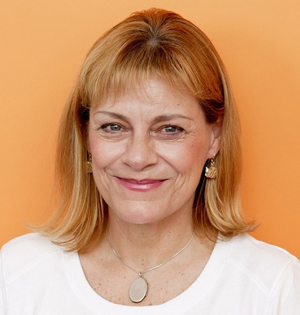 According to the Alpha Partners Report, Jackie Pullinger and worship leader Tim Hughes joined Nicky Gumbel and 2,000 Chinese pastors in Hong Kong for the Global Chinese Alpha Conference in April. Demonstrating Alpha’s ecumenical appeal, the conference was formally opened by Roman Catholic Cardinal Joseph Zen Ze-Kiun and the Anglican Archbishop Paul Kwong. Pastors attended from 25 countries, including China, Korea, Japan and ex-patriot communities in the USA. They heard seminars on starting and running Alpha courses in Chinese. It is a great privilege to meet inspiring leaders from different parts of the church – Catholic, Baptist, Salvation Army, Pentecostal, Lutheran, Methodist, and so much more – and discover that what unites us is infinitely greater than what divides us. Here are some eyewitness accounts.